...Israel has the highest fertility rate (3.1) among countries in the 35-member Organization for Economic Co-operation and Development. At the same time, it remains to be seen whether the numbers will affect the political landscape of the Israeli-Palestinian conflict. The upward-trending Jewish rate of 3.16 births per woman, and the corresponding downward-trending figure of 3.11 for Israeli Arabs, can lead to more confident policy decisions by the Israeli government, said demographic expert Yoram Ettinger, who published a recent report on the issue. "In contrast to the stated position of the establishment's prophets of demographic doom, there is no Arab demographic time bomb, but there is an unprecedented Jewish demographic tailwind," Ettinger, the former minister for congressional affairs at the Israeli Embassy in Washington, D.C., told JNS.org. As of September, there were 6.523 million Jews and 1.824 million Arabs living in Israel, according to the country's Central Bureau of Statistics. Ettinger explained that "conventional demography has been systematically mistaken and misleading" when it comes to Israel. "In 1898, the leading Jewish demographer, Shimon Dubnov, opposed [Theodor] Herzl's Zionist idea, contending that by 1998 there would be 500,000 Jews in the land of Israel," he said, adding that in 1944, another renowned Jewish demographer, Prof. Roberto Bachi, "urged [David] Ben-Gurion to postpone declaration of independence, since 600,000 Jews were not the critical mass required to maintain Jewish majority ... He had projected that in 2001 there would be, at best, 2.3 million Jews, a 34-percent minority." Asked what the future holds for Israel's fertility rates, Ettinger responded that demography is not linear, "and therefore the current Jewish edge will not increase, or be sustained, forever." Robust Jewish demographic trends, he said, enhance Israel's economic and military viability, and help squelch Arab hopes to destroy Israel. Ettinger believes that the 66-percent Jewish majority in the combined areas of Judea and Samaria (commonly known as the West Bank) and pre-1967 Israel, along with "a fertility tailwind and a huge untapped aliyah potential," mean that Israelis will be "more inclined" to reject a two-state solution to the Israeli-Palestinian conflict. 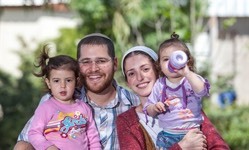 The number of Jews living in Judea and Samaria has increased by 23 percent during the past five years to a population of more than 420,000, according to a study released in March by westbankjewishpopulationstats.com. Ettinger's report states that 1.8 million Arabs live in Judea and Samaria, well below the figure of 3 million that is claimed by the Palestinian Central Bureau of Statistics. Ettinger asserted that the more aware Israelis become about the current strength of Jewish demography, the more willing they will be to eventually annex Judea and Samaria, which he described as the historical, religious, cultural and strategic core of the land of Israel. "Even if Israel's Jewish fertility rate is higher than the Arabs in Israel or in the West Bank, the demographics of the region will not change rapidly, leaving 1.5-2 million Arabs, mostly living in the cities of Area A (which is under the full civil and security control of the Palestinian Authority)," Inbar said. "The main question does not revolve around birth rates, but whether it is wise for the Jewish state to incorporate in its midst such a large hostile population," he added, referring to the Palestinian Arabs. Meanwhile, according to statistics presented at the annual conference of the Israeli Society for Maternal and Fetal Medicine, Israel has the highest fertility rate (3.1) among countries in the 35-member Organization for Economic Co-operation and Development. Ettinger is optimistic regarding the prospects for continued Jewish immigration to Israel, particularly from Russia, Ukraine, Moldova, France, the U.K., Germany, Holland, Belgium and Argentina. His report noted that in 2017, Israel's fertility rate has been higher than those of most Arab countries—including Saudi Arabia, Kuwait and Syria—and that the rate in Palestinian-controlled territories went from 5 births per woman in 2000 to around 3 in 2016. Ettinger pointed out that Arab demography is hurt by Palestinian emigration from Israel and the disputed territories, particularly in light of intra-Palestinian fighting between Hamas and the Palestine Liberation Organization.